Here is the Boston Friday the 13th sheet….literally pick and stick tattoos! Simple shading and/or coloring for these set designs. No size or drawing alterations. First come, first serve, walk in’s only (sorry no appointments) this upcoming Friday the 13th between 3pm-9pm. Doors close at 9. $31.00 each Let’s have some fun! Feel free to share this post and tell your friends…Thanks! Busy little bees tattooing over here in East Boston… There’s been alot of cover up tattoos coming through the shop lately which is fine with us, along with traditional, japanese color, script and black and grey tattoo as well. Carissa, Pat and Eric are here for your tattooing needs Monday thru Saturday hit us up for their current scheduals, check out their portfolios and see whose style suits you best! Well another tattoo convention in the books! Tattoofest 2013 we came, we tattooed, we came home. It was a great time in the booth with Mark Longnecker and Jimmy South from Endless Summer Tattoo, Kyle Miller from On Point Ink and Chris Slota from Rockabilly Tattoo. 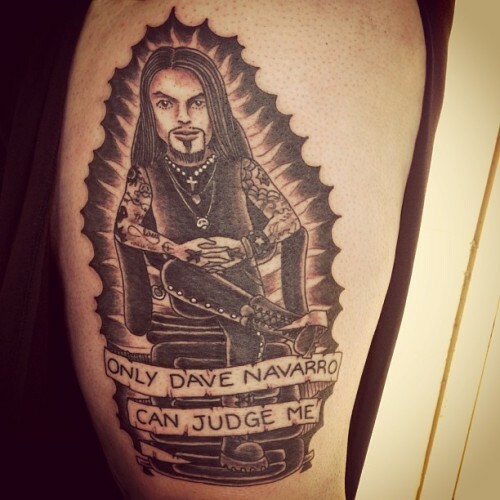 Mark took home a trophy with his “only Dave Navarro can judge me” piece and Jimmy South got robbed on tattoo of the day for the skin rip he got on his inner thigh!!! (pic is in the slideshow). Carissa had the honor to sit in Bowery Stan’s chair and get tattooed, it was kinda crazy to get tattooed by Stan with Crazy Philadelphia Eddie Funk looking over his shoulder watching….even crazier when he cleaned it with alcohol!! We made a bunch of new friends, picked up some new books and bought some new prints to proudly display in the shop. The show featured suspension shows, classic cars, live music, vendors and artists from all over….see you next year!! February’s been a pretty busy month tattooing, even though Boston has been pretty much buried in snow. Appointments are booking up fast, so get it in soon so you can show off your new ink come the warm summer months!! Also feel free to write us in for the Boston Phoenix’s best of 2013 contest, thanks in advance!! Happy belated new year all! We’re kickin off the new year on the right foot. Just got back to Boston from Puerto Rico, saw our friends at Senzala Tattoo and La Ocho Surf. Enjoyed some sunshine, rum drinks and good food. Left our comfort zone in Boston and took a little trip to New York City this week to meet up with Shanghai Kate at Sacred Tattoo. We had the pleasure to get tattooed by Kate and get to spend some quality time with her. For those of you who don’t know, Kate’s been tattooing since 1972 and has not only worked with most of the legends in the tattoo world, but is included in that list of legends. Kate has a vast knowledge of tattooing – historical and technical and we were lucky enough to have her share some that with us. The shop she was working in – Sacred Tattoo – located between chinatown and soho was an absolutely amazing shop. If you’re ever in NYC i’d definately recommend checking it out! Another thing we’d definately recommend to check out would be Tacombi in nolita….some pretty dope taco’s! !